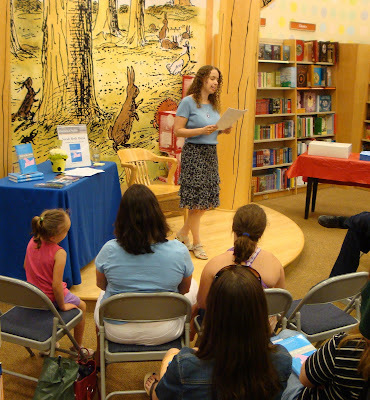 Last weekend, I drove up to Massachusetts for the book launch event for Out of the Wild at the Worcester Barnes & Noble. I had such a fabulous time! Old friends, new friends, total strangers, lots of kids, and of course... cake! Yes, after I talked and read, we ate Julie. Vanilla cake with buttercream icing and raspberry filling. Yum. You want to hear something disgusting that I probably shouldn't admit in public? When we brought the leftover cake home, we had to throw away the cake from the book launch for Into the Wild in order to fit it in our basement fridge. Not freezer. Fridge. We had year-old cake in our refrigerator. For months, we've been saying that we must throw it out. But we were afraid that if we removed it from the numbing chill of the fridge, it would scurry across the floor, scare the cat, and disappear into the walls to haunt us forever... We didn't dare open the cake box as we scooted it out of the fridge and into a trash bag. It landed in the bag with a very solid thunk. Apparently, after a year, cake petrifies into stone. Now there is lovely new leftover cake in its place, and I promise that I will not let this one sit there long enough to either petrify or grow tentacles and a personality. Anyway, thank you to everyone who came to my book launch! You all made the day really special for me. Sending you many hugs. If you're in NYC this Wednesday, I hope to see you there! Congrats! Sounds like you had a good time. *tears of jealousy* Utah! Utah!! *mouth water* Thee looks awesome!! Congrads Sarah!!! Yummy cake. Cute skirt. I want that book! Amy: Thanks! I had a great time. For the cake, I just went to our local bakery. Our local Carvel will also put any image on an ice cream cake. I'd bet that your cake people are the exception. Q: Thanks! That's my "Wild" skirt (since it has flowers and vines and such in the design). Ryan: This is so awesome!!! I love it!